IMISCOE has opened nominations for its 2015 Maria Ioannis Baganha Dissertation Award. The Network has awarded this prize annually since 2010 to stimulate and recognise excellent PhD research in the field of migration, integration and social cohesion in Europe. IMISCOE’s website is frequently visited. As from 1 May 2014 we have welcomed 2.2 millionth hits. In this period the number of visited pages was 523.500 , the number of visits was 127.500 and we counted 49.700 unique visitors. With unique visitors is meant unique devices (the websites ‘talks’ with computer, smartphone, Ipad etc). The number of unique persons that have visited our website in the period from May is estimated on 8.000 - 10.000. The number of subscribers on the IMISCOE website has almost doubled as from last May and is at the moment 1400. This number is still increasing; in November 2014 with approximately 20 persons a week. The messages IMISCOE Network Office puts on Facebook are frequently read by 200 to 400 persons. CMS - (cms 2:4) in print. 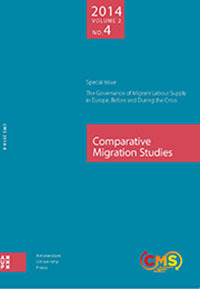 Special Issue entitled " The Governance of Migrant Labour Supply in Europe. Before and During the Crisis".